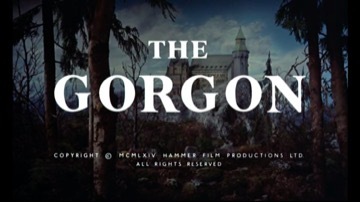 Opening title:- “Overshadowing the village of Vandorf stands the Castle Borski. From the turn of the century a monster from an ancient age of history came to live here. No living thing survived and the spectre of death hovered in waiting for her next victim.”When his son Bruno is killed in mysterious circumstances, Professor Heitz travels to Vandorf hoping to find out the truth; but instead he is greeted by a conspiracy of silence involving Dr Namaroff, the top medical man there, and the police. The superstitious, frightened villagers try to make him leave but he refuses, determined to get to the bottom of the mystery. Then one night he is lured by a siren-like voice to the Castle Borski, where he stares straight into the eyes of the Gorgon. Instantly, he begins to turn to stone…..
Barbara Shelley had already appeared in horror films, such as “Cat Girl” (1957) and “Blood of the Vampire” (1958, written by Jimmy Sangster). For Hammer, she also made “The Secret of Blood Island” (1965), “Dracula – Prince of Darkness” (1966), “Rasputin – the Mad Monk” (1966) and “Quatermass and the Pit” (1967): This was the second time in his career that actor Michael Goodliffe played a statue. In “Up the Creek” (1958), he played the statue of Nelson on top of his famous column in Trafalgar Square!